← Decelerating Global Warming ! In 1960, all houses in London and across the UK were still heated by coal fires. I was starting primary school then but well remember the coal lorries delivering a few Cwt of coal for open fires to each house. Our street lamps were still run on coal gas and needed to be lit each night. All the civic buildings in UK cities were stained black with coal smoke, and each winter several thick dense smogs would descend across London killing thousands of the elderly and sick. The transformation from burning coal locally to a centralised energy distribution (electricity, natural gas) has dramatically improved public health, air quality and the environment of Britain, despite consuming more energy today. 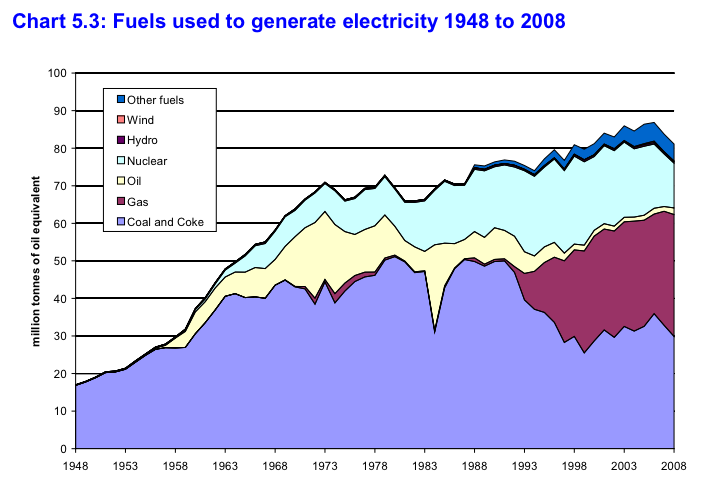 You get some idea of just how quickly the UK switched from coal in the graph below showing “primary energy consumption” taken from the 60 year aniversary DUKES review . Primary energy consumption shows the first level energy sources. Coal and Gas can then be used to generate electricity as a secondary source. The only primary “electricity” sources are hydro and nuclear. Hydropower sources have changed little over the last 60 years. The increase is due to the initial expansion of Nuclear power in the 60s and 70s, which was then abandoned in the 80s for political reasons. There has been a small increase since the 90s in “renewables and waste” which is mainly burning waste. 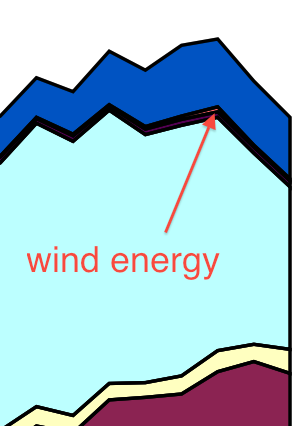 Wind and Solar power sources have been used only for electricity generation since about 1997. Figure 2. shows how electricity has been generated since 1948. This shows that coal remains very important to the UK electricity supply with an increase in natural gas generation over the last 10 years. Nuclear made significant impact but has been falling from its peak of nearly 30% mainly due to anti-nuclear lobbying following Chernobyl. The small rise in renewables to around 5% is mostly due to bio-mass plants. 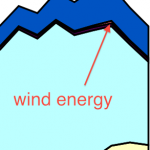 The contribution from wind energy up to 2008 is negligibly small as can be seen in the blow up. 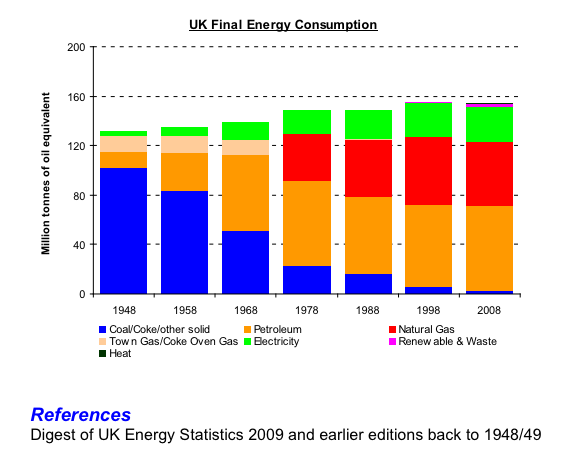 How should the UK transform its energy consumption over the next 60 years? Reliance on fossil fuels will certainly need to reduce. Close up showing the tiny net contribution from wind farms (orange). This is not just because of all the hype over climate change but rather because the availability of cheap oil and gas will gradually diminish. Cutting UK carbon emissions by 80% as prescribed in the 2008 Climate Change Act will have no measurable effect on global temperatures but could destroy our economy. The UK oil production peaked in 2000 and is now falling. Oil and gas are essential in the medium term for transport, industry and heating, so it makes sense to concentrate on electricity production. Future scenarios also envisage transport and industry relying more on electricity than primary energy sources. Therefore it makes strategic sense to move to generate electricity from alternative sources. Current electricity needs are 380 TWh and this will need to double to about 560 TWh in another 60 years. Can wind and solar take over this role as is constantly pushed by green politics? Unfortunately there is no chance whatsoever of wind playing more than just a minor role. This fact is continuously drowned out by green political spin. To see this let’s look at how far we have got with wind energy (compared to nuclear) using 2010 data after more than 20 years of investment. One of the tricks of the trade is to quote generating capacity for wind and solar to make its contribution seem larger than it is. The capacity is the maximum power achievable under perfectly favourable conditions i.e. steady wind at optimum speed. The reality turns out that generated electricity is well under 30% of that figure. However other renewables – namely hydro and biomass are far more reliable operating at about 70% capacity – so another trick used is to quote total renewable generation as being 5% of total. The general public then assume that renewable=wind+solar. This hides the uncomfortable fact that the total contribution from all wind farms to UK electricity generation was just 7.95 TWh in 2010 or only 2% of UK needs. Furthermore, without hugely expensive investment in pumped energy storage systems wind will remain unreliable and uncontrollable. In other words despite the huge visual impact on our countryside and the massive subsidies paid out for wind energy, it still can only manage a negligible contribution to UK requirements – roughly half that from old and static hydro power. Just one ageing nuclear plant in Hartlepool generated 450GWh more energy than all UK wind farms summed together! Currently nuclear is the only non-carbon energy source capable of shifting the balance away from fossil fuels. 1. Nuclear Energy must play a significant role in providing future energy needs. Realistically Wind Energy can never provide more than ~ 5% of UK energy needs while remaining publicly acceptable. The basic problem is the low energy density, < 2 W/m2, so to be significant vast tracts of what is left of the British countryside would have to be carpeted by wind turbines. Nor are they sustainable either since steel, concrete and rare earths do not bio-degrade, so the whole lot will have to be dug up (and probably not replaced) after 20 years. Nuclear Fission plants are a solved problem and can be built and operated at a competitive energy price. Modern designs will have built-in safety and the waste problem is easily solvable. They are however, only sustainable so long as uranium prices remain low. Eventually fast breeder reactors or thorium reactors may be needed to extend energy production if cheap uranium becomes scarce. 1. ITER – the international magnetic confinement reactor based on Tokamac design. This is the most likely path leading to successful energy production, and first production reactors within 30 years. 3. Muon fusion is the most intriguing as it very nearly works. Muons are heavy electrons which can form tiny muonic atoms with deuterium and tritium. This allows the nuclei to fuse at low temperatures releasing ~17 MeV of energy per reaction. It needs more than 120 MeV to create one muon which can then trigger 100 (or more) fusion reactions before decaying. Therefore on paper it could work. However energy losses in muon production and electricity generation have caused most physicists to abandon the idea. However there is one Australian company and some Japanese researchers which continue this quest – the pay back would be immense . Somehow in the next few years politicians need to listen to the voices of engineers and physicists rather than the superficial votes to be gained from following the green lobby. In the end the buck stops with the government – not with Greenpeace or FOE. 2. David JC MacKay, Sustainable Energy without the Hot Air. P.109. This entry was posted in Climate Change, Energy, Science and tagged DECC, sustainable energy. Bookmark the permalink. The 2008 UK Climate Change Act was an act of herd madness before the financial crash. It will eventually have to be repealed as 80% reductions in CO2 by 2050 would be economic suicide on a Shakespearean scale achieving precisely nothing. Is Scotland living in a time warp ?